A fundamental issue in microeconomics is the explanation of how consumers allocate limited incomes to the purchase of different goods and services. The microeconomic theory of consumer behavior assumes that changes in incomes, tastes, prices, and other variables may affect the consumption equilibrium. Changes in income or prices affect the budget constraint. Changes in preferences affect the utility function. Many students find it difficult to visualize such changes. 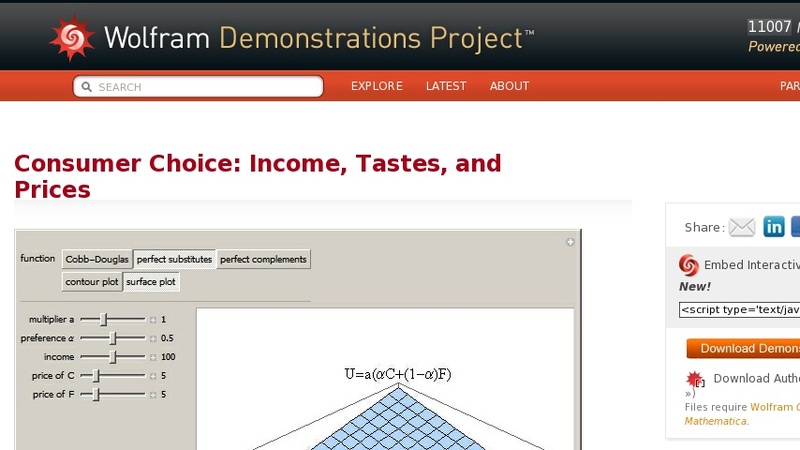 This Demonstration examines the influences of such changes for three common types of utility functions, Cobb–Douglas preferences, perfect substitutes, and perfect complements. The contour plot shows the effects of parameter variations on the consumer's indifference curves, and the surface plot shows the effects on the corresponding utility surface.